Beautiful chairs, ceramics, leather, wood engravings, metal sculpture and jewellery kept visitors happy at Stockbridge over the midsummer weekend - and the sunshine helped too, of course! Under the heading "Art of making" we'll show our top quality contemporary work including ceramics, textiles, jewellery, metal, furniture and woodwork, leatherwork, sculpture and printmaking. "Art of Making" will run from 6th July until 3rd August in Basingstoke's Willis Museum and there is no charge for admission. The exhibition is an opportunity to be inspired, to buy and to commission one off pieces. Basingstoke's Willis Museum is found in the historic heart of Basingstoke, in the former Town Hall building in Market Square at the junction of Winchester Street and London Road. It was good to come "out of Hibernation" after such a long and dreary winter and to meet up with others in the Guild. Although small the venue was welcoming and the old Town Hall has been repainted outside since our last visit. Double doors open onto the high street pavement and we had a lot of visitors -probably encouraged by our beautiful new banners which at 3.5m high made quite an impact and were visible from all directions. We welcomed two new members, quilt maker Lyn Stallybrass and Diccon Dadey who is a sculpter. We also had Andrew Boddington with us who was a guest exhibitor and works in glass. Diccon's work was displayed both inside Alresford community centre and outside in his truck. Many people were intrigued by the contents of Diccon's truck parked outside, apparently overflowing with metal sculptures ranging from bicycles, birds and fishes to a cheetah. Wow! For a while now we've longed for a glass artist in our guild. So we were extremely pleased when Reading based Andrew Boddington agreed to join us as a guest. (No pressure there, Andrew). We know and value Andrew and his work from co-operations, exhibitions and Reading's Studio Trail. Walking through Reading one encounters particularly beautiful glass panels made by him - always a delightful surprise. 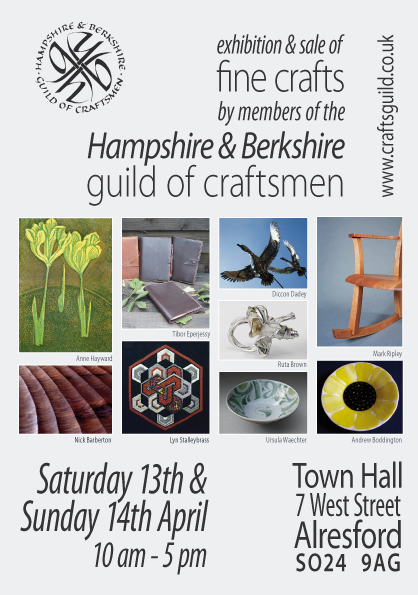 "I'm looking forward to my first exhibition with the Guild of Craftsmen this weekend." says Andrew "I've worked on projects with fellow exhibitor Mark Ripley, producing sacramental furniture with glass inserts for a local church, and this is a marvellous opportunity to meet new artists and see their work." His preparations for the upcoming exhibition are well under way. "I'm currently working on new pieces of fused glass work for the exhibition, with the usual trepidation when opening the glass kiln to see if the firing has been successful. There are always many variables to control when designing a new piece, and I've had problems with incompatible glass cracking on cooling – all part of the fun of glass forming!" As well as more modern fused glassware, Andrew will also be showing traditional leaded and copper-foiled panels, and can discuss the design and construction of bespoke windows and panels to fit specific locations. ​Many members have published books about their craft, here is a summary of those currently available at Amazon (of course other suppliers are available). Alresford Craft Show fast approaches. Saturday 13st April and Sunday 14th April 10am-5pm on both days. Get out, feel inspired and maybe buy some presents for special events coming up this summer. Catch up with your favourite crafts people and see what we've been up to over the winter. Maybe combine it with a trip on the Watercress Line. Confirmed to be there are Mark Ripley, Tibor Eperjessy, Ursula Waechter, Anne Hayward, Gloria Pitt, Nick Barberton, Ruta Brown and our new members Lyn Stalleybrass and Diccon Dadey. As well as a guest we're very pleased to welcome - Glas artist Andrew Boddington. We would like to let you know about the events we have planned so far for this year. More details will follow closer to the dates. Of course individual members will be present at a great number of events, which can be seen on their individual pages or in this blog. Starting our year is the Alresford Craft Show on the weekend of 13-14 April. We are tempted to make this another regular one, so do tell others and invite some friend. Later in the Summer we'll be for the first time at the Willis Museum in Basingstoke. The Exhibition will be from 6 July to 3 August. Odiham will be in late autumn, early winter but we don't yet have a date for it. We really look forward to seeing you again! Odiham is our annual late autumn show and an ideal opportunity to buy some very special christmas presents. It is held in the beautiful Cross Barn Odiham with easy parking, disabled access and refreshments. Friday 23rd through to Sunday 25th November. We'll let you know opening times closer to the event. The Cross Barn is in Place Gate, Odiham, RG29 1JX . Here you find a link to a map.